archy: Anyone need a little house in Seattle? Anyone need a little house in Seattle? As you may know, my life is going through a lot of changes right now. One of those changes is that I need to give up my little house. 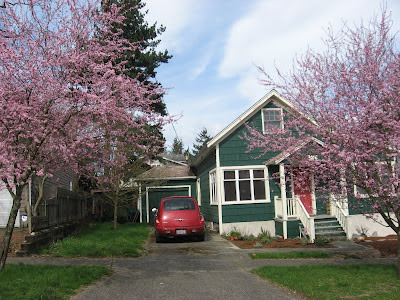 The house is in north Seattle within walking distance of Green Lake. It has three small bedrooms and a large loft. It was built in 1906 and doesn't have a single square angle in it. The plumbing is new from street to faucet. The neighbors are nice. It has a gazebo in the yard. I let the yard go a little over the last year, but there are roses, blooming cherry trees, roses, a large lilac bush, and an old spruce tree. Order now and I'll throw in yard tools, a table saw, and all the bookshelves you can eat. If you are interested, write to me at archymarquis at aol dot com.